Vacation time has arrived (finally!) and I couldn't be any happier. Well, maybe if I won that huge $500 million dollar Lotto this week I would be happier, but why split hairs? I'll take whatever I can get. So now I have two whole weeks of pure bliss without the alarm sounding at 5:30 in the morning to look forward to. I almost don't know what to do with myself, but tomorrow I think I'll start by sleeping in and then making cookies to get into the holiday spirit. What's next? Who knows! Today, in honor of the day before break/holiday festivities occurring at work I thought I would wear something festive and fun, like sequins and plaid. Upon seeing my sequin top many colleagues commented on how shinny and sparkly I looked. 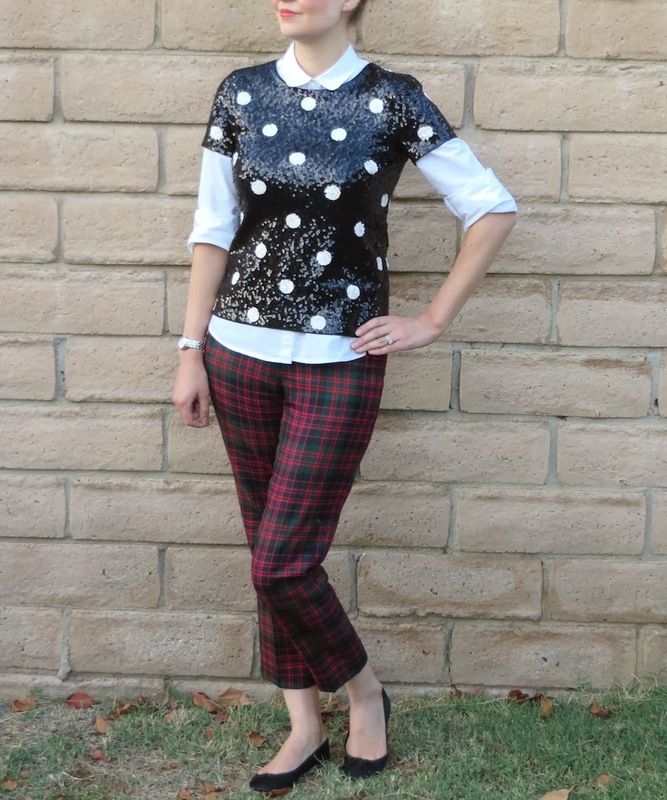 I love this sequin polka dot top from J. Crew, but it tends to get stuck on everything due to the sequins. For example my hair kept sticking to the sequins and eventually I put it in a bun. As you can see I am not very practical when it comes to fashion. For those of you who have a vacation to look forward to too, enjoy! What are your plans to celebrate being liberated from work? Lovely outfit and happy break! I have to work Monday but am hoping to wrap it up shortly from home so I can go enjoy the last game at Candlestick park. We have a few day trips planned out and a wedding on NYE. Hoping time creeps by so I can enjoy it! Thanks Laura! I hope you are able to get out early tomorrow and that the last day goes by quickly. I also plan to take a few day trips, but we will see how that works out.